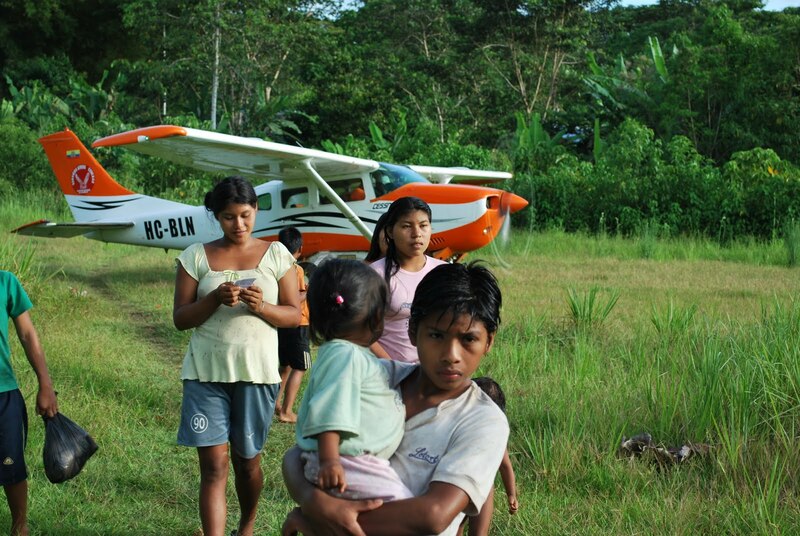 Flying over the Ecuadorian Amazon or ‘Oriente’ in a Cessna light aircraft is a major highlight of Tropic’s Huaorani Ecolodge adventure. With the 40 minute flight taking off from the small jungle town of Shell, passengers are introduced to Ecuador’s long and difficult history of oil development. Named after Royal Dutch Shell, the town was built as part of the oil company’s early prospecting missions in the Ecuadorian jungle during the 1930s. The town made international headlines in 1956 when a group of missionaries led by Nate Saint were speared to death by Huaorani warriors after an attempt to consolidate contact with the indigenous group went tragically wrong. On take-off, the capital of the province Pastaza, Puyo, comes swiftly into view. Founded in 1899, this jungle city with a population of around 35,000 inhabitants is the largest conurbation in Ecuador’s jungle. It is also home to roughly 200 Huaos who come to the city to work. The offices of the Huaorani national body, Nacionalidad Waorani del Ecuador (NAWE) and women’s organisation, Association of the Waorani Women of the Ecuadorian Amazon (AMWAE) can also be found here. Heading east any signs of urban settlements diminish rapidly as seemingly unspoilt rainforest consumes the landscape in every direction. Look a little harder and one may spot the unmistakable signs of paved and then unpaved roads with huge trucks thundering along in a cloud of dust. Scattered settlements with a couple of houses catch the eye as the sun bounces off the tin roofs. As the years have passed Ecuador’s indigenous groups including the Huaorani have been subjected to greater attempts to integrate their ancestral lands into the national development project. Those attempting to resist oil, logging and agricultural development have found themselves in deep water and susceptible to accusations of undermining Ecuador’s progress. However, the five Huaorani communities which own and co-manage the Huaorani Ecolodge are resisting this one-dimensional and linear concept of development. Generating a source of income at the community level through tourism, combined with efforts to protect and monitor their 55,000 hectare rainforest reserve are making valuable contributions to Ecuador’s development. The conservation of an irreplaceable reserve in the Amazon and mitigation of untold carbon emissions from avoided deforestation also fits neatly with the growing consensus on how best to tackle global warming in tropical countries. As the clock on the Cessna’s cockpit reaches 40 minutes and the small Huaorani community airstrip comes into view, passengers may feel to be travelling back in time as the stereotypical signs of development left behind in Puyo vanish. However as the Huaos of Quehueri’Ono will shortly be demonstrating their community tourism project combined with the conservation of a 55,000 hectare reserve offers an arguably more sustainable and pro-poor alternative to what was left behind in Shell. I had the great pleasure to visit Quehueri'ono in 1996 with an English friend named Rachel. We were accompanied by our guide and chauffeur from Quito. Back then our group stayed in a small communal lodge with latrines outback. We cooked in a cook hut and ate outdoors. We carried in all our food and carried out our garbage. I also carried out with me a wonderful experience that I will never forget. I did drawings of some of the Huaorani. I wonder if they still have them or did the jungle insects eat them up? I was fortunate enough to preserve some of these moments on film and had the movies transferred to DVD the other day. What a great way to relive the good times. I wish Moi Enomenga and the five communities great success with this Eco Tourism project and in saving the reserve.